It’s been a while since I updated this blog so it’s high time that I did! Well, it seems that networking and making business cards is paying off. I have had more frequent bookings recently (but not as frequent as I would like still) and have met new faces, artists and learned even more about our small community. A little while ago I was happy to be invited back to a drop in drawing group that I had worked with. More recently I was asked to model for a class during the day at a local city run arts centre. I had been doing some job searching online and decided to e-mail them about myself in the off chance that they may be looking for models. I had forgotten that I had sent them my info when my cell phone rang and it was the model coordinator asking if I was available during the days. Luckily I had a week of vacation planned and was able to model for the class during one of the sessions. It was a fantastic experience. Very nice group, I had a great time modeling for them and talking with them. I am finding that I am being approached more and more with questions about how I started figure modeling and why I am doing it. I like to be able to share my story but only with those who ask me first. I don’t want to bore anyone who may not even want to know. 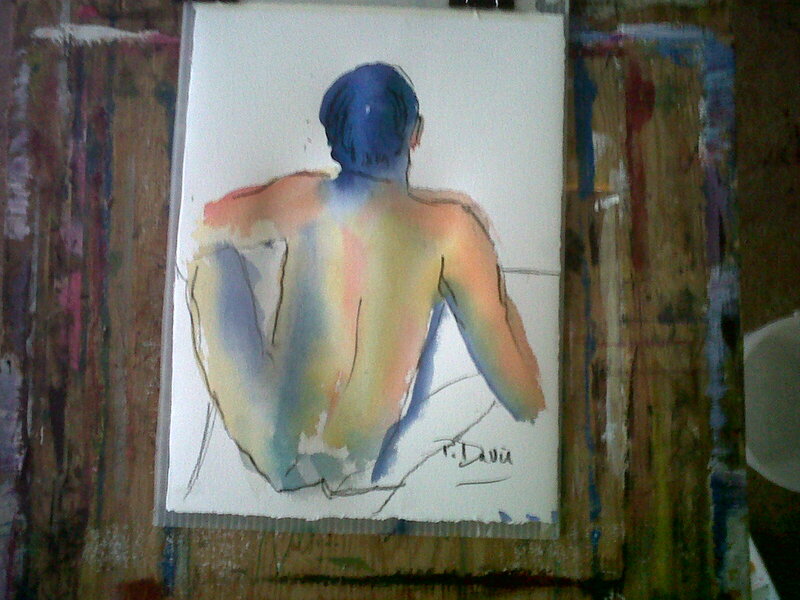 Various mediums were used by the class participants including watercolours. I saw one watercolour and made a positive comment about it and asked if I would be able to take a picture of it. I was surprised when the artist said “You can probably just have it at the end of class.” I said that I would love it and asked if I could purchase it instead. No, I was given the drawing and I am in the process of finding a frame. I had a good chat with the teacher of the class and the staff at the centre about modeling and availability and took the opportunity to spread more business cards around. Another surprise is that I was contacted by a local artist who saw my Facebook page. He apparently learned of me because another artist “Liked” my page and he was curious. I got talking with him about the local figure model scene and he told me that there are male models, but not many and they seem to be well hidden. People are looking for them as most of the available models are female. He also stated that many of the local artists are getting tired of the same models time after time. He stated that there was a discussion that they wanted to find a “chunkier” male models as most of the available ones thought they had to be athletic and buff. I told him that if they were looking for a chunkier model, look no further! He took all my info during our session and said that he would be passing it around to others he knows who are looking for models for drawing groups and one on one sessions. He also is booking me again to complete a pose he was drawing of me. He seemed interested that I listed “en plien air” modeling as something I would do. Years ago an artist friend of mine asked me to to model for her but she wanted a mountain setting. We found an out of the way spot outside of the city and I loved modeling outdoors. I told the interested artist that as soon as the weather was back to summer temps. I would love to be able to model outdoors. I hope that this happens. I have a return session to look forward to, I hear rumblings of another Draw Till You Drop weekend possibly in March and possible other opportunities. I would like to be able to model at least once a week, which around here is pretty steady work if you aren’t employed by a school. A little while ago I was pleasantly surprised to be contacted to model again by a group near me. I was thrilled and accepted right away. This is the group that is very laid back, informal and full of energy. I eagerly anticipated the time I was going to spend with the group. Upon arrival though, I did have my first experience ever of being double booked for the night. There was a new group coordinator and she contacted me to model, not knowing that the former coordinator had someone in place for that week. So, both of us turned up! I was carrying my hiking stick I like to use for a prop so there was good natured joking that they wouldn’t cancel me as I was likely to use the stick on them. We were offered either 1/2 of the session each or just one of us. I said that it didn’t matter to me, just as long as the group had a model to use. in the end, the other model opted to take the night off and return the next week instead. She is relatively new to the game as well (3 sessions total) and I was lucky enough to get to talk to her quickly before getting ready to model. She is loving modeling as much as I am. Great to hear! 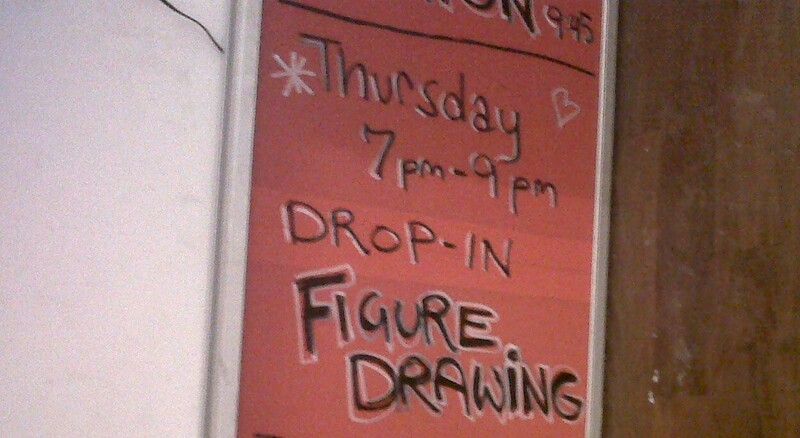 The group was bigger this last time, about 12 people in total, many who had never figure drawn before. The time passed all too quickly but during the break and at the end, I received thanks from the various artists and positive comments on my poses and my use of negative space, foreshortening and making sure that I rotated my poses and facing different artists. It was great to be back with this group. I gave the new coordinator my business card and I hope to be invited back again soon.